Washington officials have played down the significance of Russia sending a squadron of warships to the Caribbean for a joint exercise with Venezuelan Navy, but what kind of force exactly will be maneuvering in America’s backyard in one month’s time? It was U.S. State Department spokesman Sean McCormack’s job to explain the U.S. Administration’s view on Russia’s maritime exercise. He called Russia-Venezuela joint naval exercises close to American territorial waters a joke. “I've once said that the old Russian ships could not make it that far down to Venezuela. And I had seen one report where I think they were actually being accompanied by tugboats”, McCormack said. Russian naval squadron heading to Venezuelan coast consists of 4 ships: Russian Northern Fleet's flagman nuclear-powered guided missile cruiser Peter the Great, antisubmarine warship Admiral Chabanenko and 2 auxiliary vessels. 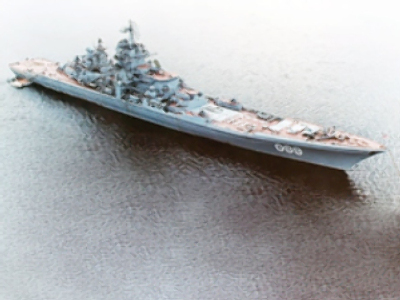 The flagship of this naval group cruiser Peter the Great is one of the world's most powerful destroyers. Russian Heavy Missile Cruise Ship, Project 1144.2 Kirov Class Peter The Great was built by the Baltic Shipyard in Saint Petersburg. Its construction began in Soviet-era 1980s and it was commissioned in 1995. It was designed to send to the bottom large surface targets, particularly aircraft carriers and to defend itself and the fleet against all possible air and submarine attacks. The ship has unlimited cruising endurance due to its propulsion system based on a combination of nuclear power and steam turbines, with four nuclear reactors delivering 28,000 hp. The propulsion system provides a full speed of 31 knots (31 nautical miles per hour or 36 m/ph or 58 km/h). The warship is equipped with Granit (Nato designation SS-N-19 Shipwreck) anti-ship cruise missiles (20 missile launchers) able to destroy targets at a distance up to 500 kilometers. In ripple-fire mode, the lead missile follows a high flight trajectory, while the other missiles follow a low-level flight path. If the lead missile is intercepted then one of the other missiles automatically takes on the lead role. An S-300F Air Defence Missile Complex is installed on the ship, with twelve launchers and 96 vertical launch air defence missiles. The ship also has two double close range Osa-MA Air Defense Missile launchers and 40 missiles. The system operates autonomously or it can be integrated into the ship's combat systems and download target data from the ship's sensors. Osa-MA has a range of 1.2 to 10km at an altitude between 25 and 5,000 m.
The ship is equipped with a Kashtan Air Defence Gun/Missile System (Nato designation SS SA-N-11 Grissonwhich) which provides defense against a range of precision weapons including anti-ship and anti-radar missiles and air bombs, aircraft, and small naval ships. Two command modules and six combat modules are installed on the ship. The command module provides autonomous operation by detecting the threats, distributing the threat data and designating the targets to the combat modules. The combat module automatically tracks the target with radar and television, calculates firing data and engages the target with missiles and guns. The missile range is 8 km and the gun range is 1.5 km for altitudes up to 4,000m. The system can engage up to six targets simultaneously, one for each combat module. The guns can fire at a rate of 1,000 rounds/min. For anti-submarine warfare the cruiser has ten torpedo tubes for 20 Vodopad-NK anti-submarine missiles or torpedoes. The ship has two anti-submarine and anti-torpedo rocket systems, the Udav-1 with 40 anti-submarine rockets and the RBU-1000. The ship has two RBU-1000 six-tube launchers, with 102 rockets. The ship also has 130-millimeter multi-target “AK-130” gun mounts (840 shells) with a range capability of up to 22 kilometers. Three helicopters can be carried on board. Antisubmarine warship Admiral Chabanenko as a main weapon for attack has anti-ship system with Moskit missiles, two Kinzhal rocket launcher systems (64 missiles) and a Kortik rocket launcher system to protect against air attacks. The ship also has an anti-submarine system with two quadrupled torpedo launchers. The ship is equipped with two helicopters to conduct intelligence in the air. Peter the Great has enough arms on board to sink two or three air carriers together with any warships accompanying them. Russian military experts believe that in terms of firepower, Peter the Great and Admiral Chabanenko exceed all the fleets in North and South America combined – excluding the U.S. fleet. Russian authorities do not comment on the fact that Peter the Great’s Granit missiles have nuclear warheads – for political reasons – but there’s little doubt a warship will travel half way across the globe stripped of its main firepower.